We camp A LOT. Actually, we used to camp much more when we lived in Florida (and we could even camp on the beach sometimes! ), but we still have a lot of fun camping in and around Tennessee. Truth be told, I am SOOOOoooo thankful for my many years of experience as a solo camper on all those biking trips! Anyhoo, here are our best tips for surviving your first — or your next — camping trip. Say what? !… Yep, we always take along an old pair of shower shoes , sandals, or flip flops, or slip-ons, or water shoes. Whatever footwear you’ve got that you don’t mind getting wet (and/or muddy). Whenever nature calls in the middle of the night, they’re easy to slip on and off. When you’re headed down to the swimming hole or the pool, who cares if they get wet? Or, even if you lose one! The other is a 27-in-one (or something like that!) Swiss Army Knife. We mostly use that one for the tweezers (removing ticks, splinters, glass), scissors (you’d be surprised how many times you need to cut something), knife (for campfire cooking, food products, opening things), and much, much more. Every good camper has some. Every good campfire needs some. Nothing works better at starting a campfire from scratch than some good old fashioned clothes dryer lint! It’s better than twigs. Better than wood chips. Better than shreds of paper. It’s the cheapest, quickest way to create some serious flames. And it packs light. (There. Now you can’t say that you don’t learn “valuable” information here at The Fun Times Guide!) Start saving all your dryer lint, now. Here’s another great method… Who knew you could start a campfire using a chocolate bar and a soda can?! There’s nothing better than sitting around the campfire at night in a great chair… for hours. And you want to be comfortable. Bonus Tip: We always take along a radio too. (That is, unless Jim decides to take his guitar instead!) You’d be surprised how many people play their tunes all day long. Similar to the unspoken camper’s law to be trustworthy, campers are also quite courteous though. And everyone honors the campground’s “noise policy”. If you really want to enjoy this camping trip, then you’ll want the time you spend inside the tent to be just as much fun as the time you spend exploring the campground and the sights & sounds of the surrounding area. If you’re not comfortable inside that tent, then you’re in for a long night… if not a long weekend! Make sure there’s plenty of headroom and legroom when you (and all who will be sleeping in that particular tent with you) are lying prone inside the tent. If you’re even close to touching the sides, then it’s too small. Get one of those cheap tarps found in sporting goods stores. You will place the tarp between the ground and the floor of your tent. No, not for comfort, but as a barrier between the moisture that builds up on the ground overnight, and as a way to prevent rocks from poking through the floor of your tent. Bonus: the tarp could also be used to cover everything on and under the picnic table in the event of a sudden rainstorm. Make sure that your tent provides plenty of ventilation. No matter what size tent you end up with, the fact remains: Tents are relatively small spaces, and you’ve got to fit all your “stuff” and a couple of bodies inside there — comfortably! If you don’t have a lot of windows & vents (that zip open and closed), then you will surely HATE camping. Here’s a list of the most important things to look for in a tent. Regular pillows will become sticky in hot, humid weather. Plus, they tend to absorb moisture from the air. Travel pillows and camping pillows have protective coatings that prevent this. We have the absolute coolest camping pillow… it’s this one. The best part is the inflatable bladder inside, so you can make it just as “firm” or “soft” as you want! The newest thing on the market is the self-inflating travel pillow. Don’t go investing in some high-dollar sleeping bags like we did unless you are planning to make a habit of this weekend camping stuff. If not, then stick with your old, bulky, musty-smelling sleeping bag from years gone by. This, after all, is camping — a form of “roughing it”. And no matter how hot it is outside or how cold at night it gets, I guarantee that you will find great value in having a thick ‘ol sleeping bag — if nothing else than for the thick padding separating you from the hard ground below, and/or as a blanket to knock the chill off you at night. But, if you are really serious about this camping stuff, give us a shout and we’ll tell you about our Slumberjack sleeping bags with thinsulate that keep you warm in all temperatures and pack down to 6-inch by 6-inch in their own built-in stuff sacks! Add to that, a Therm-a-Rest sleeping pad, and you can sleep on the ground many nights in a row without any complaints. If there’s one thing all of those solo biking & camping trips taught me it’s this: Always pack light and tight! For us, just about everything we take with us camping fits into its own appropriately-sized stuff sack. (They make them super tiny these days!). We’ve traded all of our bulkier/heavier towels for the lightweight/thinner ones that hold a lot of water and dry really quickly. The official Packtowls have magical properties that I don’t even try to understand, but in short — they can absorb something like 10 times their own weight in water! We use these as our shower towels and our beach towels. And they’re even great for the dog too! You won’t believe how many times you just want clean hands… or to “freshen up” after a day in the hot sun and close quarters of a dirty (if not muddy) bug-infested campground. I pack lots of unusual items in different-sized zip-lock plastic bags. They’re just so handy! Some examples: playing cards with notepads and pens, Kleenex, extra batteries, a wet washcloth pre-soaked in soapy water. And, if you plan on cooking chicken or beef, they even provide the perfect way to marinate your meat first. I also use plastic Ziploc bags in the following way: I divide up an entire container of wet wipes by placing 3 to 5 of the individual cloths into separate sandwich-size plastic bags. One goes into my camera bag. Another into the pet tote. And another under the front seat in each car. You get the idea… Anyone need a wet wipe?! COOLER – The extent to which you pack your cooler is completely up to you. You could choose to take along all of the foods and beverages that you’ll need for the entire duration of your trip. But we usually don’t — because part of the fun of camping in the wild is scavenging for food and exploring locations you haven’t been to before! We enjoy trying new foods from new places — even if it happens to be the campground snack bar/convenience store. Although we usually make at least ONE full-out effort to dine at a fun new place at a nearby town. ICE – You’ll need ice for soda pop and for your favorite adult beverages! SNACKS – Whether it’s the traditional Smores ingredients, your favorite low-cal sweet treats, or munchies for whenever the urge hits you… this is another time when Zip top bags are useful. In this case, they become mini food suitcases! HANDHELD FLASHLIGHTS and/or a CAMPING LIGHT – as in “more than one”. MATCHES – Waterproof matches would be nice, but they’re certainly not required. BATTERIES & CHARGERS – for your flashlights, cameras, phones, electronic games, radio, etc. HAT – Camping is not conducive of many “good hair days”. And if you’re anything like me, you’ll be leaving the makeup and hair products at home! INSECT REPELLENT & BENADRYL – because you don’t want to get any tick bites or mosquito bites! (Our favorite mosquito repellent is Permethrin.) The Benadryl will lessen allergic reactions to bee stings & insect bites. TRAVEL SIZE TOILETRIES – they’re much easier to pack & store than full-size bottles. For what it’s worth, I used to store all my toiletries in gallon-size ziploc bags, but I noticed that everything inside the bag became sour smelling after a few days. Now, for longer trips, I use mesh travel bags instead — because the tiny holes give everything inside room to breathe. I have this set. Finally, the outdoor adventurer in me requires that I remind you to take along something that will make you “feel like a kid all over again”. PLAYING GAMES — Take along a deck of cards, some paper and/or some board games. It’s like the good ‘ol days, with everyone gathered together and doing the same thing — without the television and other electronic devices. Here are some interesting camping games. WALKING — Pick your pace: Many enjoy power-walking or leisurely strolls along the scenic, twisty roads that typically wind through the campground areas. Whether you’re just leisurely walking or enjoying a day of hiking, make sure you pack some comfortable walking shoes! SINGING SONGS around the campfire — with or without the guitar. Here’s a great list of campfire songs (and the audio files, so you can hear how they’re supposed to sound). Adults and kids alike will enjoy singing all their favorite songs around the fire. BIKE RIDING — There are plenty of bike paths and paved roads with shoulders that are just perfect for a leisurely bike ride at most campgrounds these days. Don’t forget to take your bikes! SWIMMING — Whether you’re headed to the nearby lake, swimming hole, or campground swimming pool, don’t forget the swimsuit. CANOEING or KAYAKING — You could rent a canoe or a kayak for a little bit of exercise and excitement on the water. SIGHTSEEING — If you get the opportunity to visit the nearest town (for a day, or an hour), do it! Take the time to be a carefree tourist with no cares or worries for a unique change of pace. Here are the 10 best apps for traveling like a local. DOG DAYS OF SUMMER — Don’t overlook the big fun that can be had by taking your dog along on the trip! 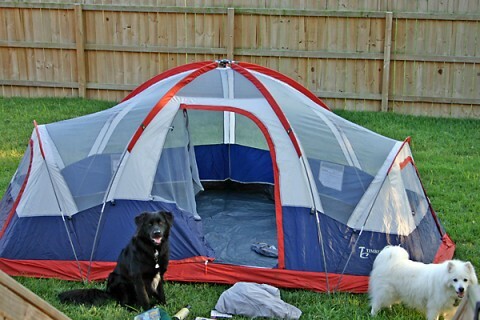 Just like kids, active pets will help you to experience camping on a whole new level. PHOTOGRAPHING — Do not miss the opportunity to photograph your time spent in the great outdoors. You might even make a day of it photographing nature as you see it.